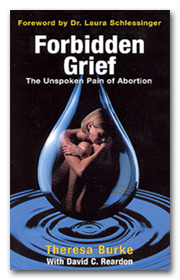 "Forbidden Grief" is a compelling review of Dr. Theresa Burke's experience in counseling hundreds of women for abortion-related emotional difficulties. Dr. Burke exposes the obstacles in the way of post-abortion healing, reviews the full range and depth of post-abortion adjustment problems, and illustrates how we can create a more understanding and healing society where women will no longer be required to hide their pain. 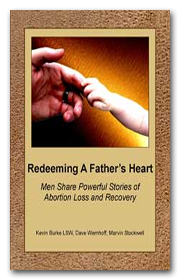 Redeeming A Father's Heart presents the powerful stories of 10 courageous men with the common desire to present the truth of their abortion experience and the consequences of this life changing decision. These accounts are inspirational testimonies that journey deep into the heart of male post abortion pain... ultimately revealing the miraculous manifestation of God's transforming power. I regret my abortion; if you do too, there is help! Registration to this survey gives you access to the free online survey which will offer a list of healing resources designed specifically based on your survey results. Various programs to help survivors of childhood or adolescent abuse, especially sexual abuse, to move beyond their abuse experiences. This website offers a free 30 day Free Me to Live online Bible study emotional/spiritual healing course. The course consists of daily 10-15 minute lesson plans (sent via email), weekly pod-casts by author and pastor Ken Freeman as well as additional resources to provide further support throughout the course and follow-up support once the course has been completed.